Wet finishing: Warm water soak about one hour followed by several minutes of machine agitation. Machine dry on medium for about 30 minutes. Laid flat to complete drying. Here is a close up of the visual textural I got from the slubs in the yarn. The thick and thin of the yarn also gave me a slubby looking, uneven selvedge, which is in character with the shawl overall. I pondered quite awhile over the fringe. I liked the appearance of the yarn, so I had hopes of a loose fringe. The problem with a loose fringe of course, is unraveling. In the photo below, you can see how I prepared to give loose fringe a try. On the left, you can see my hemstitching. I used a 10/2 natural cotton, which gave a neater appearance than using the slub yarn. I left about 8 inches of warp unwoven before weaving in another inch of plain weave. After I took the shawl off the loom, I used my sewing machine to run a row of zig zag across that inch of plain weave. 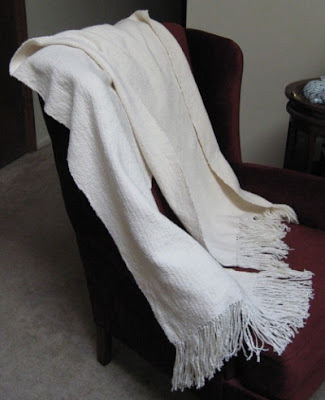 This let me wet finish the shawl without messing up the fringe. After the shawl dried, I cut off that zig zagged part and knotted the ends of the fringes. 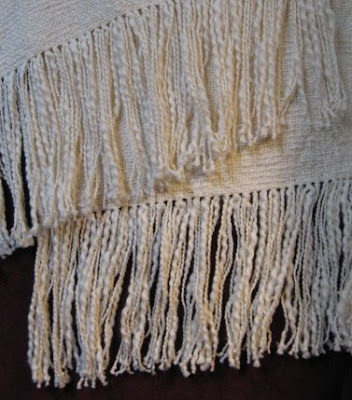 Usually knots don't look well on fringes, especially fine yarns. However the yarn was so slubby anyway, I didn't think the knots would be too noticable, but would still help keep the yarn from unraveling. Here's how it turned out. I don't know yet how well this will wear, but I think with gentle hand washing and lying flat to dry it should be okay. I also want to mention that it's thicker and heavier than I expected, but it is wonderfully warm and soft. Its beautiful! It reminds me of snow so what a good name for the yarn. I really like the fringe and thanks for the lesson agian. How lovely, Leigh. It will be so nice to have something to wear that you have woven. So you hem stitched *and* knotted. I've got my dishtowel warp on but I'm pondering. I've never done hem stitching and would like to try it but I've never seen dishtowels with fringe and I'm sure that's for a good reason. Do you have an earlier post where you discuss dishtowels finishing? No wonder I only weave one thing a year! 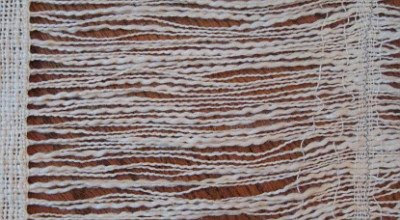 I've found this experiment fascinating - I was commenting to Meg last week that I've had occasion to observe slubby cotton flake in my weaving while using it as scrap cptton in samples, and had made plans to use it either for a plain shawl or as the warp in a scarf. I'd sampled it thinking I'd use it in some babys blankets I recently made and decided to go with Conshohocken cotton instead, so it's delightful for me to see that someone else has had a similar idea and that the result is so lovely! So nice yummy is my word for it. I think that "simple" can be beautiful. And you've proven it with this project, that's for sure! I really need to be careful or I will soon be looking at looms. And I don't need a loom. I don't have the space for a loom. Oh my. I'm behind on responding to comments. I am encouraged by your comments! I realized today that I've been bored with my weaving for the past several months. The texture in that shawl really got me motivated again! Jenadina, your photos look great! Should be lovely weaving. Sharon, I do have a post on finishing dishtowels, here. Geodyne, I think that yarn would make lovely baby blankets. It's definitely soft enough and the texture is fun. ohhhh! For me? Why you shouldn't have!! (grabs shawl and runs away). I love it both for the simplicity of the weave, and I do love plain weave, and the texture of the yarn. Your idea for stabilizing the fringe is one I hope to remember! It looks great! 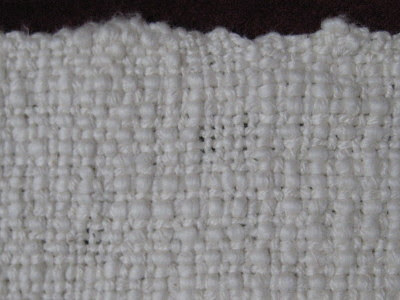 It is amazing how plain weave can set off the characteristics of a yarn. In my quest to conquer a knowledge of all weave structures and variations, I tend to forget the "less is more" principle. I'm really a simple girl at heart. Your comments help me keep that in mind. Beautiful!! Soft and yummy. I love your yarn choice with plain weave. Leigh, snuggly and yummy looking. Just the thing for a cool evening, or to throw over the back of a chair. I love the nubbly yarn stuffs, it gives everything so much texture, I just want to grab it and go of course after I rip it out of Taueret's hands in a mad dash.